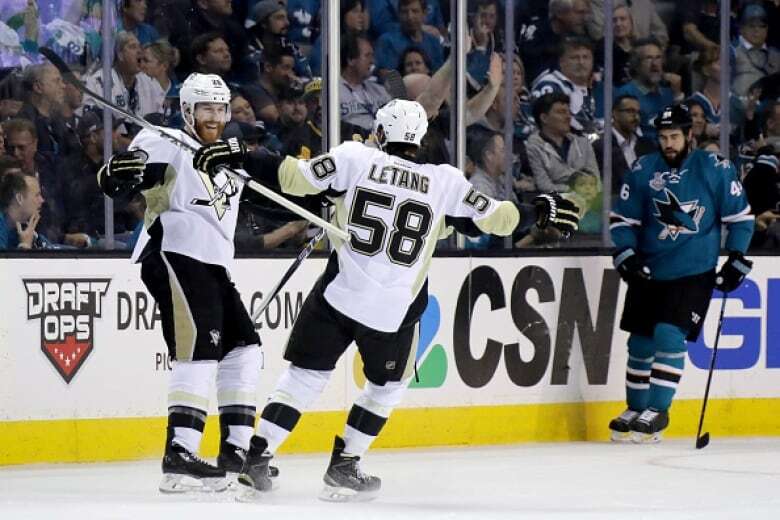 The Pittsburgh Penguins, now with a 3-1 series lead, are one win away from becoming Stanley Cup champions after defeating the San Jose Sharks in Game 4 of the Cup Final. Bounce-back performances from two key players moved the Pittsburgh Penguins to the brink of winning the Stanley Cup. 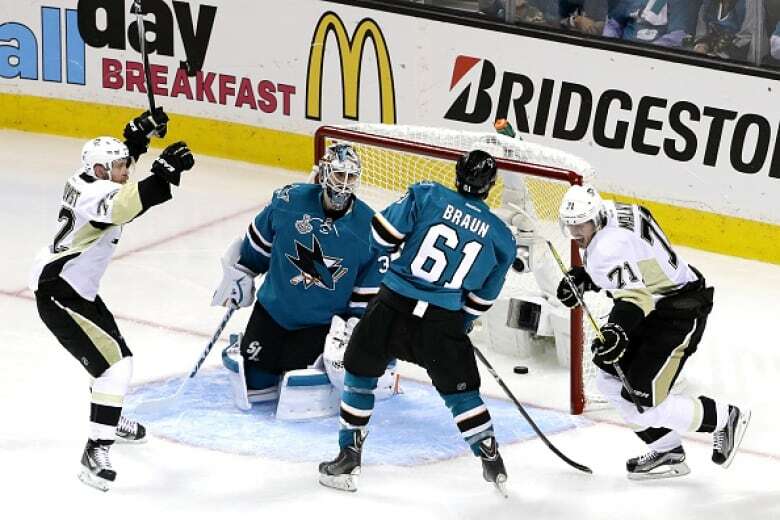 Evgeni Malkin scored his first goal of the series and Matt Murray made 23 saves after a shaky Game 3 to lead the Penguins to a 3-1 victory over the San Jose Sharks on Monday to establish a 3-1 series lead. The Sharks outshot and outblocked the Penguins in this one, but were stymied on two power plays while allowing the Penguins to convert on one out of two. "Got to produce," Sharks captain Joe Pavelski said. "The game needs to be simplified and we have to recognize that. We have to keep putting it to the net." Malkin woke up after being held pointless in the first three games of the series by setting up Ian Cole's goal to open the scoring. He added one of his own on the power play to give Murray all the support needed. Murray was steady in net put the Penguins one win away from skating off with their fourth Stanley Cup in franchise history. They can do it at home in Game 5 on Thursday. "Just keep doing what we're doing. Obviously, we know what's at stake," Penguins captain Sidney Crosby said. "We don't have to change a thing, just keep playing the same way we're playing and the results will take care of themselves." The Sharks were unable to build on their first win in the Stanley Cup Final, allowing the first goal for the fourth straight game and going more than nine minutes without a shot on goal during one stretch of the second period. San Jose will need to win in Pittsburgh to extend the series. "Moving forward, scoring first will play a big role in giving us a chance," Pavelski said. "There's no time for frustration. We have to keep going. The chances are there, we have to find a way." 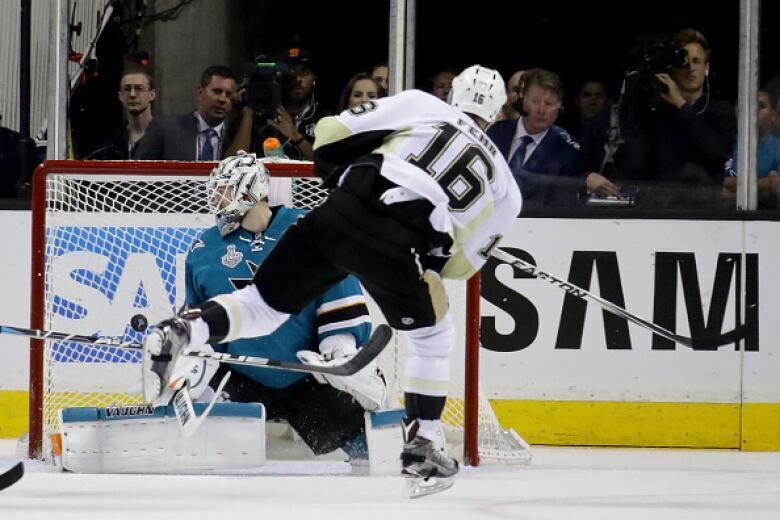 Melker Karlsson scored the lone goal for San Jose while Martin Jones made 17 saves. The story for the Penguins after their 3-2 overtime loss in Game 3 was how to get Malkin going after a slow start to the series. He was energized from the start of Game 4, helping to set up the first goal and then tapping in the second off a feed from Phil Kessel for Pittsburgh's first power-play goal of the series. "You try to just stay with it. You just try to make sure you execute," Crosby said. "We had a really good first [period], generated a lot of chances. I think that built some confidence. We got a great play from [Kessel] and [Malkin] there to get us a big goal." Murray wasn't tested often early and went nearly the first half of the second period without facing a single shot. When the Sharks picked up the pace, Murray stopped Patrick Marleau on a breakaway and denied a one-timer by Pavelski early in the third before allowing his first goal. Karlsson beat him on a rebound of Brenden Dillon's point shot with 11:53 to play. But Murray didn't flinch and came up big again against Pavelski to preserve the lead, keeping the NHL's leading goal scorer this post-season without a point in the Stanley Cup Final. "We didn't generate enough chances, but neither did they," Sharks centre Logan Couture said. "They scored on their chances and we didn't." The Penguins have not played from behind for a span of 435:56 since a Game 4 loss to Tampa Bay in their previous series. Pittsburgh's only two losses since came in overtime games and they didn't trail until the final goal. "We've been chasing the game the whole series by not scoring first," said Sharks coach Pete DeBoer. "That takes you out of your four-line rhythm. It affects all parts of your game."